LutherCountry, the German federal states of Thuringia and Saxony-Anhalt, still has much that Luther would recognize. And it is easy to find, from medieval houses along Germany’s Half-Timbered Houses Route to cultural treasures, such as castles and gardens. But this part of Germany offers more than the distant past: it is the cradle of the Bauhaus design movement, which celebrates its centenary in 2019. And it’s all just a couple of hours from Berlin. Driving is a great way to explore LutherCountry. In the towns and villages, wide market squares and narrow lanes are lined with half-timbered houses dating back to the Middle Ages. What could be better for an atmospheric selfie than a backdrop of buildings crisscrossed with ancient beams and painted in blue, yellow or green? And knowing that Martin Luther actually saw them and may have eaten and stayed in them makes the experience extra special. 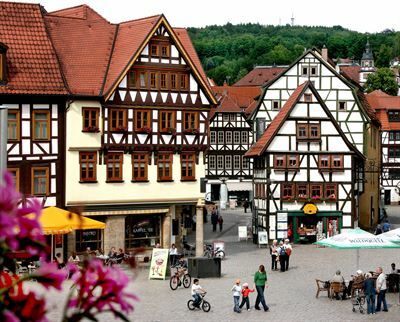 To find them, follow Germany’s Half-Timbered Houses Route. One stop is Schmalkalden, with its Old Quarter. Among the maze of cobblestoned lanes is the Luther House, where the Reformer once stayed. Above the front entrance is a large white swan, part of Luther's coat of arms. Built in 1520, this is a fine example of the local style of half-timbered architecture. Other towns with impressive examples of timber-framing include Mühlhausen, Stolberg, where Martin Luther preached, and Bad Langensalza, with its natural mineral spa. With its woods and meadows, LutherCountry is one of Germany’s greenest regions. Gardening has long been a passion here. As Luther, an avid green thumb, said: “In a delightful garden, sowing, planting or digging are not hardship but are done with a zeal and a certain pleasure.” Today, he would love Erfurt’s egapark, with Europe’s largest ornamental flowerbed, as well as the comprehensive German Horticultural Museum. He would be fascinated by the magnificent 17th and 18th-century Garden Kingdom of Dessau-Wörlitz. Covering 55 square miles, this UNESCO World Heritage site is dotted with palaces and gardens, many reflecting English horticultural influences. See it all by hiking and cycling, horseback riding, or even cruising along in a gondola! Luther was not just a great thinker; he was an innovator. And that is typical of the “can do” attitude of the locals. Back in 1919, the Bauhaus School was founded in Weimar, before moving to Dessau. More than just architecture, the movement transformed attitudes towards urban planning and domestic design, from chairs and lamps to chess sets. As part of the Bauhaus centenary celebrations in 2019, two new museums will open, one in Weimar and the other in Dessau. Both cities are UNESCO World Heritage Sites; both are where Luther lived and worked. If you need assistance, please send an email or call Monday – Friday, 9 a.m. – 4 p.m. Central European Summer Time. Would you like to step inside the very room in which Martin Luther translated the New Testament into German, or admire the pulpits from which he preached and where pastors still preach today? Do you want to taste beer brewed the way Martin Luther liked it? Then come and visit LutherCountry, where you can explore Luther’s old stomping grounds and much more! LutherCountry is situated in the heart of Germany and has so much to offer, from fascinating churches and museums for the believers and history or culture fans among you, to beautiful landscapes that could be straight out of a children’s picture book. What do the places in LutherCountry all have in common? Centuries ago, they were the stage for Martin Luther’s tumultuous life and thus played a special role in the Reformation, which changed the way people thought about so many aspects of daily life. Martin Luther’s influence spread through Western Europe and, with European settlers, to the United States. Although Luther lived five centuries ago, his presence is still tangible today. Grab your suitcase and come experience the unforgettable – LutherCountry is waiting to be discovered! Previous articleExcellent young scientists offered research opportunities at NTU in Singapore, and MIT in the U.S.